Here is a new exciting game called Jezzball Deluxe. This is a totally new kind of a remake of the popular Jezzball/Xonix game. The aim of jezzball is very simple: at every level you will need to reveal the colorful picture without hitting the various moving balls. Even though the game might seem to be very easy, its fabulous gameplay makes it really addictive. Numerous difficulty levels will make this game interesting both for novices and pro players. You will also appreciate the excellent graphics, a great variety of special effects and ear-pleasing music, composed specially for this game. 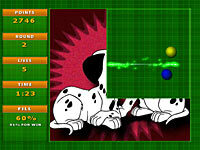 Try it and you will definitely fall in love with this exciting new jezzball game!